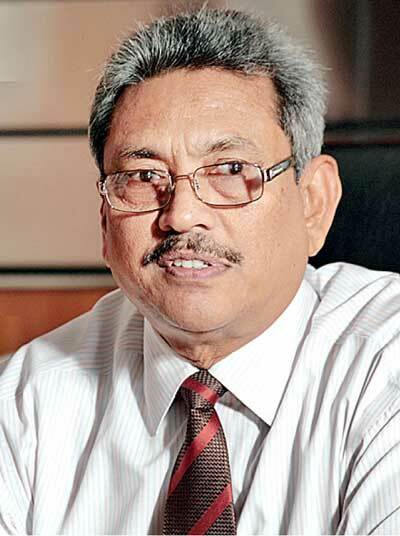 Speaking to the media recently, Gotabaya Rajapaksa, the former Defence Secretary, sought to explain the ongoing inquiries into serious “mishandling” of public funds by the Rajapaksa family and their associates, by reiterating the common defence of a political vendetta. Taking up the pose of a person wronged, he claimed that this is the usual reward in our history for those who have done “service” to the country. The historical process will also visit those behind the present persecutions, and he warns; “in a manner hundred times worse”. Rajapaksa does not say whether this increase of “hundred times” in the scale of the historical retribution is warranted because the unnamed perpetrators are doing hundred times more “service” to the country. Proportionality, reasoning and even humility are not the strongest mental aspects of those who think in terms of dynasties and their entitlements. As a family they are special, gifted with sharp insight and awesome skills, taking to public life only because of their infinite love for the poor. During the so-called Arab Spring (2010/11) we saw several long-entrenched dynasties fall rapidly in country after country in the Middle-East. In Egypt, the all-powerful Mubarak, after ruling for 30 years, in Libya, the Gadaffi family in control for more than 40 years, in Tunisia, Zine Ben Ali family, 25 years of absolute power, were all swept away in one angry wave of public opprobrium. And a few years prior to that, in Iraq, the cruel regime of Saddam Hussein family was ended after much bloodshed and turmoil, that unfortunate legacy continuing even today. Before the deluge, these families were the defenders of the faith, protectors of the clan and the best hope against the wiles of the West! Until oil was discovered in their lands, the Middle-Eastern countries were economically weak and of little significance in a global sense. Invariably, their leadership seemed corruptible; cunning, narrow minded men, ruling their semi feudal societies with iron fists. Petro dollars changed the image of the landscape from an arid inhospitable desert to a gushing money spring, drawing millions to the Arabian sands in search of fortunes. Whatever that caught the fancy of the ruler could be obtained with the new found dollars. If they wanted to impress the visitor with a sparkling capital city it was easily done. When it occurred to the despot to have a spanking army, money would be thrown at it like nobody’s business. Those who visited Bagdad or Tripoli when the dynasties were entrenched would have marvelled at the well-planned streets, beautifully-maintained parks and the wide city squares. No prestige project was too expensive for the egos of the ruling families. Pomp and pageantry was the easy substitute for what they lacked in true greatness. The observant visitor sensed that something was amiss. An uneasy feeling that the whole show was a mirage, the closer you examined its inner workings, further into the haze it retreated. Nobody wanted to talk freely, criticism could be high treason. All systems worked only to please the ruling family. Some of these countries had armies equipped with the most modern weapons available in the market. But, in the field against an “A” grade army, they would not stand for more than a few days, if not hours. Soon as the first salvo hit them most of the army would quickly melt away to their Bedouin lifestyle again. Much money was thrown at improving the infrastructure of these countries, or to be more precise, those projects that members of the dynasty thought appropriate. There is no shortage of capital for investment in these oil producing countries. Yet the dynasties, never managed the double digit rate of development that several Asian countries achieved in recent decades. The effect of most of the so named development efforts was superficial, senseless; bringing very little return on the investment. When the whole truth was finally known; it was even worse than they had always suspected. The relentless draining of the country’s wealth by the ruling families, huge bank accounts and plush properties in European countries, the pervasive corruption, the ill-legitimacy of dynastic rule maintained only by the brutality of the army and the secret police; the people were numb with shock, now left only to bemoan the lost decades. It is no surprise that even today the Petrol poor, but democratic Israel, has the highest standard of living in the Middle-East. They are easily the strongest too. When Gotabaya Rajapaksa talks of having done much for the country, there is also much he conceals. The fact that his brother was elected to power, on a broad political platform, and then used that voter endorsement to entrench his entire family in positions of such power that they virtually dictated everything in this country is something that does not seem to concern him at all. There has never been a Secretary like Gotabaya Rajapaksa before. Everybody, including Ministers of the Government, cowered in front of him. All other Secretaries reach that high public service position only after long years of service. They are inevitably products of our universities, some even with foreign post graduate qualifications. Years of service inculcates in them values such as financial responsibility and political impartiality. On the other hand, even the staunchest admirer of the former Secretary will not claim political impartiality as one of his virtues. In Gotabaya’s mind, politicisation of State institutions was no offence, its long-term harmful impact on the vital public service only a trivial issue. When the Government ranks celebrated the removal of the sitting Chief Justice in a highly-political impeachment process, there was the Defence Secretary Gotabaya Rajapaksa in Parliament, enjoying the festive mood. The Rajapaksa family rule placed Gotabaya in a most enviable position. He had an open cheque, the first claim on any money available. Unlike on other public servants or even Ministers, there were no real constraints on his power. The services of a peacetime army were available to him at a mere beckon. It is said that he had a decisive say in the appointment of high State officials like Ambassadors and the Attorney General and even judges of the superior courts, an area far removed from that of a military mindset. And accountability, that most essential ingredient of good governance, seems to be lacking in all spheres of his activity. The fundamental Rajapaksa ethos was that the family was not to be criticised or questioned. To hold him to account was akin to challenging a son of Saddam Hussein when the man had begun to think of himself as the legitimate successor to the Babylonian kings. Hosni Mubarak could have claimed speciously that he had been endorsed by the Egyptian people, notwithstanding the weak credibility of the electoral process that obtained it. Public endorsement alone does not amount to good governance. On the other hand, nepotism and good governance will not stand together. A person, whose appointment to public office is based on family ties, cannot take the moral high ground. He is there only because the ruler is morally corrupt. Like in the dynastic Arab countries, after 10 years of the Rajapaksa Government, the country is nearly bankrupt. Countries that start from a low base, especially when a war had ended, can reach a very high rate of growth. For several years since the expulsion of the Taliban, Afghanistan achieved a double digit growth rate. After 2009, when the LTTE was completely defeated, whether under a different way of ruling, a much better country, both economically as well as politically, would have emerged is a moot point. Of course, given our political culture, that was far too much to expect. On the contrary, Mahinda Rajapaksa even moved to amend the Constitution, doing away with the two term limitation on the presidency. Although the war was won, terrorism eradicated, the “war” footing was continued. All attempts were made to create a siege mentality, family members moved about only with huge retinues of armed bodyguards. Had Mahinda Rajapaksa won the presidency again, or even won it several times again, all indications were that the near comical security frenzy would have continued indefinitely. Which security expert would have been gutsy enough to tell defence czar Gotabaya Rajapaksa that all this security hoo-ha was only hype? ‘Are you mad? Do you want this great man, my brother, killed?’ he would have bawled, while showing the poor expert the door. It had become part of the dynastic mystique, too valuable a trick with the voter, to be stopped. The exit of the Rajapaksas does not mean the end of dynastic politics in this country, nor does it mean the end of corruption by any means. These are too ingrained, winning social sanction by its pervasiveness. Why should I not promote my family, when that is what everybody else is doing? As has been shown repeatedly in the Arab countries, spring is not always followed by a bright summer. The seasons’ gains are reversed long before that. Our politicians, like Hosni Mubarak of Egypt, have no intention of leaving the stage in a hurry. They are doing too much “service’ for that! Like Mubarak, they also perhaps prefer that we, the people, go somewhere else instead!